The window garden is located in the double parlor that was added to this Federal/Victorian house around 1850. I refer to the wing as the “music room” simply because my pianos reside there. 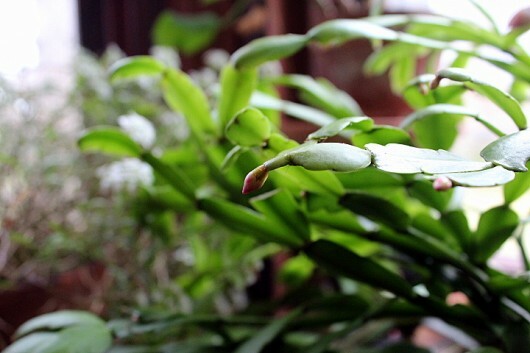 And speaking of pianos…houseplants certainly love music. Mine are partial to the preludes and fugues of J.S.Bach, the Ballades of Frederic Chopin (I often play the Ballade in G minor), and almost anything from Claude Debussy. On the pop front, they enjoy Adele’s “Someone Like You.” I don’t know how they feel about Katy Perry or Justin Bieber. The south-facing window is actually a bay of 3 windows. For the dramatic display and easy care of plants, I outfitted the exposure with glass shelves and a broad sill. 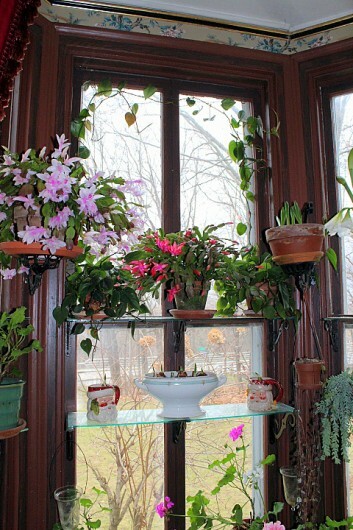 Note: You do not need a Victorian bay window in order to make an exuberant indoor garden! You can attach glass shelves to any ordinary window. You can broaden the sill, too. Just follow these easy instructions. Enough blathering. Let’s look at the houseplants! 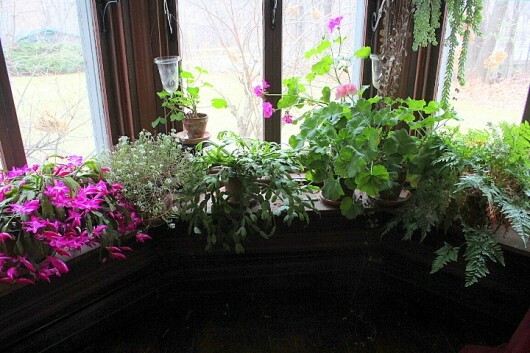 The sill, from left-to-right: Schlumbergera truncate; white alyssum (rescued from the outdoor garden), Schlumbergera bridgesii, zonal geraniums (properly, they are Pelargoniums) in shades of pink, and Davallia feejensis. 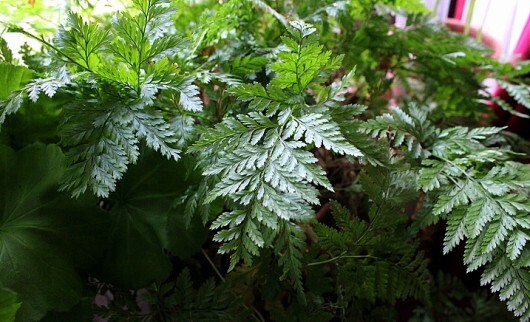 And the graceful green rabbits-foot fern. Did you know that this Davallia fejeensis is as old as the dinosaurs? ‘Tis true. I propagate and care for the plant this way. 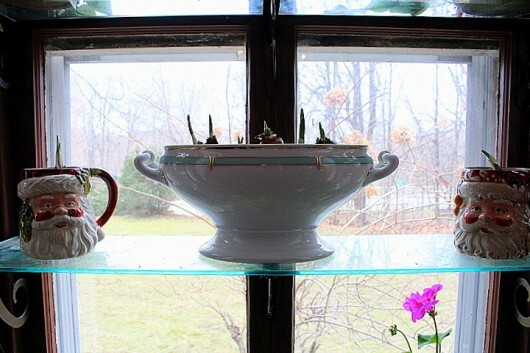 On the first shelf of the middle window are some tropical bulbs I’m forcing for Christmas bloom. The blue and white soup tureen contains sweetly-scented Chinese Sacred Lilies. Santa mugs that flank the tureen are planted with softly-perfumed Narcissus ‘Inball.’ How I grow tropical bulbs in pebbles, water, and gin. The flowers are upright in form. To me, they resemble birds in flight. Oh. Not sure about the difference between “Thanksgiving” and “Christmas” cacti? See this post. 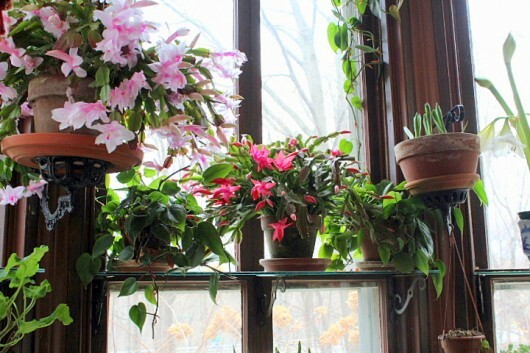 Top shelf, middle window: a red Thanksgiving cactus, flanked by common philodendron vines. To the right, on a lamp bracket, is a pot of Ornithogalum bulbs. These I’m forcing for the fun of experiment. You’re still standing on the piano bench and wish to alight? Oh dear. Let me help you down. Shall we have a seat in the music room, and maybe sip a little wine? Good. I’d love to hear about the plants in your own window garden. Anything blooming for you just now? Hi Jeane – You can tell the difference between the “Thanksgiving” and “Christmas” cacti by looking at the leaf segments (and flowers). Details and pictures here. They DO look like birds in flight! Delightful! The only things blooming at the moment are African violets and pelargoniums. Am ready to pot up some rooted cuttings of English ivy, and have a couple dozen cuttings of plectranthus rooting in vases of water. Plectranthus was new to me this year, and a revelation. Purple leaves setting off masses of vibrantly alive lavender blossoms in late summer, which were much loved by the sphinx moths. I fell head over heels, and envision all these cuttings grown large with the pots hidden by hosta leaves and fern fronds to bring the shade gardens alive next August-September. At this moment it’s snowing and blowing, so your photos are doubly beautiful to me today. I really came here to get the chive pesto recipe after running out before the snow started to harvest all the chives, parsley and flowers. You’ve side-tracked me with all this beauty. Hi Mary – Snow already? Brrr! 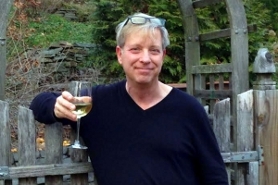 Enjoy the pesto…and the plectranthus! If you’re lucky, Kevin, the storm will wear itself out before it reaches you. My children in the Cincinnati area often get whatever we get a day or two later. 6-11 inches predicted, and 5-10 above tomorrow night. Brrr! is right! Even though I ran around like a maniac this morning to winterize the garden/birdbaths/porch, I still have an uncompleted to-do list, including emptying the fountain and disconnecting the pump. If I may quote you, and if you’ll pardon my French, MERDE! At least I have a huge bouquet of winter-sown snapdragons on the table to adjust my attitude. Blooming inside for me now are 3 pots of Oxalis triangularis, aka Purple Shamrocks, although one is the green form. The Hibiscus rosa-sinensis has 8 double red flowers or buds, brought on by the long, warm fall we had here in PA.
Also blooming are several rooted cuttings of Coleus and Hypoestes taken in summer and potted in late September. I usually pinch these buds off so roots will keep gaining strength instead of diverting the plant’s energy to a flower. The silver rosette Echeveria has a fading salmon bloomstalk. Echeveria ‘Black Prince’ is making its first flowerstalk, rising to about 6″ just now but not starting to open yet. Outside, daisy mums are still hanging on, just barely, pinks, whites and apricots, but the golden Calendula’s are defiantly wide open and in bud. Going outside now to rake leaves and run them through the chipper AGAIN ! 24 loads since mid-October, all safeguarded for future use. 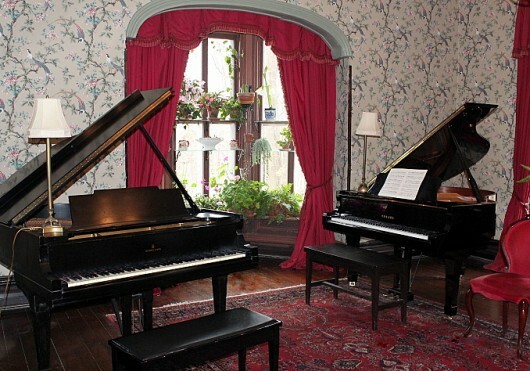 Your pianos and plants look like natural companions. Love that cactus closeup. Indoor winter gardening is quite the challenge but, going on a third year, one that I’m now addicted to. Blooming or budding now are Thanksgiving and Christmas cacti, bedding begonia, double impatiens, pelargoniums, Gerbera Daisy, million bell and annual vinca. Not many blooms but I’m still learning. I definitely need to follow your directions on putting up glass window shelves. Thanks for all your info on this website. 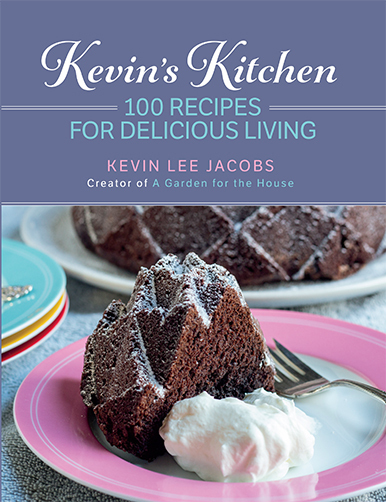 Another great read, Kevin. I right click on your links you provide and by the end I have a ton of tabs open and a full hour of enjoyment. I have a corn plant that gets abused every year. I bought it for my kindergarten classroom back in 2000. Most years it sat in a east facing window and did fairly well, even when I would forget to water it for weeks. The past 5 years it has been more west facing. The plant didn’t exactly flourish during the year but was touched by the children and it really didn’t get a ton of light. 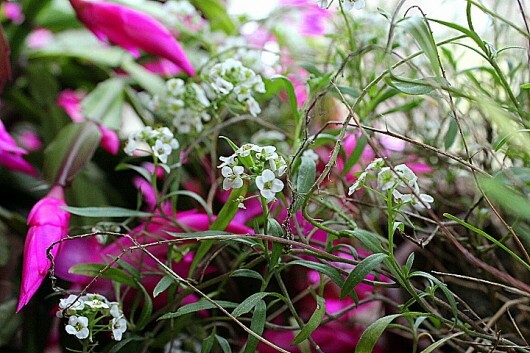 In the summer each year, I brought it home and put it under the outside deck in a bright indirect south facing space. Those 2 months are when it would recover and grow like mad. Come the start of the school year, it looked gorgeous. This past summer was the best growing season ever. Now I am retired and the plant is home sitting in a north facing low light window. The ends of many lower leaves have turned brown. Window space is limited in our house. Should I give up and prepare to throw the plant out? Is it just shedding some leaves because of the low lighting in November and being on the north side? I haven’t fed it this fall but water it weekly now. Hi Gail – I have no personal experience with the corn plant (Dracaena fragrans). So no advice for you. Sorry! What a beautiful window garden. Love the colors. zEBecause of where I live, the plant of choice is an orchid. I have various orchid varieties in trees in the backyard and they are glorious, producing jaw dropping displays February through May. Indoors I stick to phaleanopsis. They seem to do better in a controlled environment. At least for me. As long as they are not over watered, orchids are a most rewarding and easy to maintain flowering plant. The blooms last a very long time as well. We got that storm. From 8;45 a.m. to about 4 p.m. to snowed a little over 6 inches. The heavy wet kind that is snowman type snow. Now it is 21 degrees and I just remembered a hose that I did not put away. I have the brackets, but need to order the glass. Should I get it beveled on the edge? Thanks for the info! Never know how to tell the difference. Have 3 truncate’s blooming now. Also started some narcissis as per your instructions and can’t wait to see what happens! BTW, I bought a leaf shredder and had a ball making mulch for all my gardens. Thanks for the tip! We spend the winter in FL…..such whimps. All our flowers are outside our windows including a banana tree that has just started banana production. It is fascinating to see how bananas grow. The Thanksgiving cactus is beautiful. Thanks for opening my eyes to that beauty. I just checked out all the side dishes you posted. So many great choices but I decided to sit down in front of your fireplace with the butternut squash soup. The table looks lovely. You are such a great host! Have a wonderful and delicious Thanksgiving. Are you familiar with Plectranthus? It is a type of Swedish Ivy, with lovely lavender flowers (mine is flowering right now). It’s very easy to propagate from cuttings–it would look lovely in your window! I love the iron brackets you used. I plan on looking for some of those for myself! 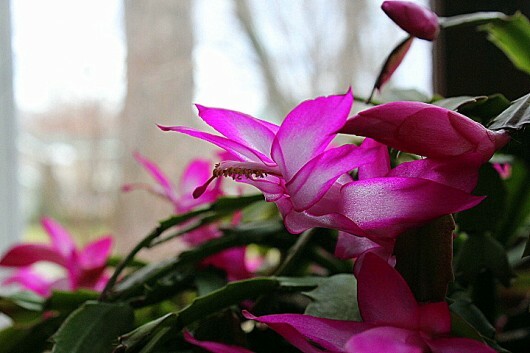 Also, apparently my “Christmas Cactus” is a “Thanksgiving Cactus,” since it is in full bloom now. Thanks for all the beautiful photos! Love your use of a soup turren. Wish i would have thought of that. I have a few and rarely use them. My bulbs are in a very plain flower pot. Boo Hoo…My Christmas cactus has not set buds yet. Do you prune yours? If so, when? I love your flovers. My cactus has more dan 120 flowers, so nice. My 49 yr old jade tree( yup, it is a tree now!) 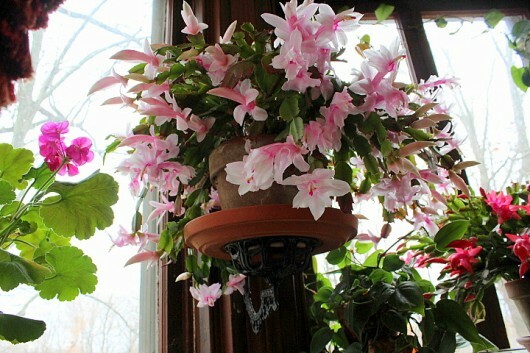 is blooming with clusters of star shaped flowers, my orchid is budded, the pink thanksgiving cacti are both in bloom, I have a streptocarpella blooming in the south window. Though the days are short her in southeast B.C. We have had lots of sun. A cyclamen which was a gift in August and had slowed down blooming is picking up with the cooler temperatures. My velthemia bulbs are budded and should bloom just after Christmas.i don’t remember it’scommon name. Outdoors it’s winter in full dress. Your window garden is beautiful. I have two Thanksgiving cacti in full bloom right now- a white one and a pink one. They are lovely. I’ve had them for several years, and each year they get bigger and more beautiful. I summered then outdoors,and when I brought them inside in October, they were immediately filled with buds. I also have an amaryllis which is just starting to push up out of its bulb and am planning to plant my paperwhiltes tomorrow. Thanks for inviting us into the music room for a good look at the window garden, Kevin! 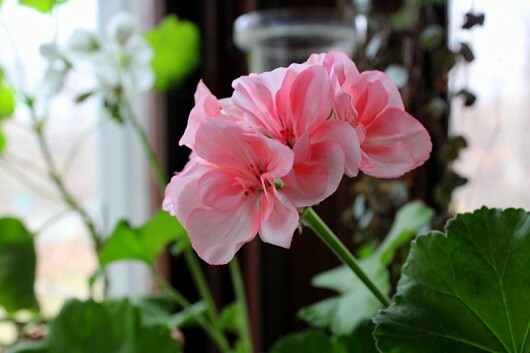 I followed your directions for preparing my outdoor geraniums (sorry, I don’t know their varieties – three are a deep pink, and three are a bright red-orange) for over-wintering, and they are doing beautifully in the south, north (!) and east windows of my 1920’s office building. Everyone on my floor enjoys the cheerful blooms. Thanks for your wonderful directions, and have a beautiful Thanksgiving! Thank you for your inspiring and cheering emails! Hi Jackie – It’s Sedum morganianum, which goes by the common name “Burro’s Tail.” What an easy plant! More details, and a close-up shot, in this window garden post. I no?tice your cactus is doing well in a relatively small pot, as is mine. Have been considering up-potting. Do you know if they like tight quarters are would they be happy in a larger pot? everything outside has bit the dust, it’s great to welcome bloomers. I received cuttings from a Christmas (?) Cactus plant that is over ONE hundred years old. The stems of the plant are like tree trucks. Quite spectular and the flowers are prolific and a sight to behold. The cuttings are now in soil and healthy. Flowers and greenery certainly help cut the sting of ” ye ole cabin fever” when it strikes. Thank you for the lovely pictures. Your window garden is wonderful! My kitchen window “garden” has mostly just green plants – a begonia, shamrock, Moses in the Cradle, but it also has a cactus that has grown to 40 inches, and I don’t know what to do with it! I broke a (limb?) off a few years ago, and the baby is now almost as tall as its mother. I’m afraid it’s going to break off at the base someday, so guess I’ll stake it — not pretty! I just subscribed to your blog and am loving it. Thanks for the wonderful ideas, great pictures, and your fun style of writing. Both Christmas and Thanksgiving cactus are blooming right now here in the PNW. The white Thanksgiving cactus is almost at the end of its bloom, The red and white bicolor Christmas cactus as well as those with pink, orange and magenta blooms are in full production. The orange one I grew from seed many years ago. The Bigonias are putting up lovely pink and white blooms which contrast beautifully with their dark red and silver leaves. The white phalanopsis is in bloom and I have two buds on my Catlaya orchid. The Hoya is getting ready to bloom again, but I will have to cut it back soon as it is getting way too big. Want a plant ( started several last year and they are strong)? I’m still looking for a yellow Christmas cactus. I saw one several years ago and when I went back to get it, it was gone, as always happens. Your window garden is so much better-looking than ours, which consists of a bunch of indestructible thirty plus-year-old plants. They have been moved and cut back so many many times. The happiest in Vermont is the night blooming cereus which is not the cactus variety, but something else. As I try to sleep at night I often miss the bloom, but the fragrance is still intoxicating the next morning. 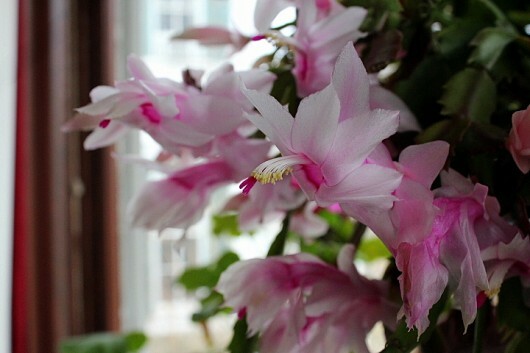 As for my Christmas cactus, in Vermont it blooms in May, prolifically. This winter I am hoping to keep alive my rosemary plant and have started some new basil plants that I hope will keep us in the occasional sauce until June when the outdoor batch might be ready. June is far away. Sigh! 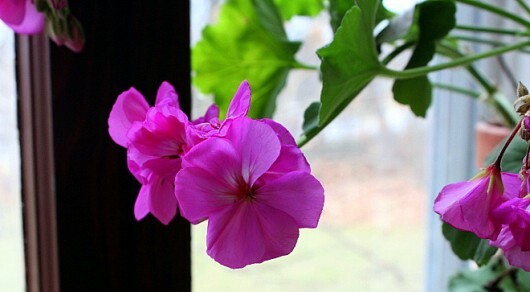 Still, this winter is supposed to be warm, relatively speaking, so that plants may have a chance indoors.